It can take up to six months to successfully get rid of a flea infestation! Just a low level of infestation of fleas in various stages in the environment can take a considerable amount of time to overcome. Since there are no products labeled that eliminate the pupal stage of the flea, it is important to keep your cat healthy and protected from fleas with a monthly preventive medicine. 1. Dryden MW, Payne P, Zurek L. Pests That Affect Human Health: Fleas Infesting our Pets and Homes, Manhattan: Kansas State University Agricultural Experiment Station and Cooperative Extension Service, September 2003. 2. Lyon WF. Fleas: Ohio State University Extension Fact Sheet, Columbus: The Ohio State University. 3. Dryden M. The Case for Year-Round Flea and Tick Control, Available at: www.capcvet.org. Accessed August 24, 2005. 4. Lane TH. 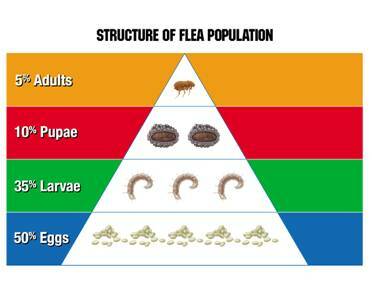 Flea Control: Understanding the Flea, Gainesville: University of Florida IFAS Extension. 5. MacAllister C. Flea Control Fact Sheet, Oklahoma Cooperative Extension Fact Sheets, Stillwater: Oklahoma State University. If you haven’t already, soon you may begin to notice some telltale signs that your pet is entering the “senior” years. Perhaps you are noticing that your pet has poor skin and coat condition or is sleeping more than they used to sleep. While these things may seem like normal “old age” to you, the fact is that any or all of these signs might be an indication that your senior pet has a medical problem that needs attention. In the past, we often accepted a declining quality of life for our aging pets – or for ourselves, for that matter – as a fact of life beyond our control. Thanks to advances in disease detection and treatment, that is no longer necessary! Routine checkups and wellness testing become more important as your pet grows older. In many cases, we can monitor organ function and detect disease even before symptoms appear. Remember: your pet ages 5-7 years for every one of yours. This suggests that health problems in your pet can progress 5 to 7 times faster and, therefore, more frequent checkups are necessary. Chemistry Blood Tests provide useful indicators of the health and functioning of your pet’s organ systems. Electrolytes are also measured to ensure that a vital system balance is maintained. Hematology Blood Tests provide a detailed look at blood cells. Red blood cell results provide information regarding oxygen carrying ability, while white blood cell results provide information on how well your pet can fight infection. Platelet results indicate how effectively your pet is able to stop bleeding. Urinalysis indicates how well the kidneys, liver and pancreas are functioning. Urine contains by-products from these organs and abnormal levels of these by-products can indicate disease including diabetes, liver and kidney disease. Serum T4 is a measurement of the level of thyroid hormone circulating in the blood and is helpful in identifying thyroid disease. Thyroid disease occurs in both cats and dogs and can have a serious impact on health if left untreated. Radiographs or “X-Rays” of the chest and abdomen are done to allow us to visualize the heart, lungs, liver, kidneys and other vital organs appearance to detect disease. Blood Pressure Monitoring allows us to check and monitor hypertension. Below are the senior wellness programs for you to choose from. The Platinum Program gives us the most information regarding your pet’s health status. It is our recommendation for your pet. Wellness exam, vaccinations, deworming for intestinal parasites, urinalysis, chemistry blood tests, electrolytes, hematology blood tests, E.C.G (electrocardiogram), blood pressure check, radiographs of chest and abdomen reviewed by a board certified veterinary radiologist, sonogram and echocardiogram performed by a board certified veterinary radiologist. Wellness exam, routine vaccinations, heartworm test, deworming for intestinal parasites, urinalysis, chemistry blood tests, electrolytes, hematology blood tests, blood pressure check and radiographs of chest and abdomen reviewed by a board certified veterinary radiologist. Wellness exam, routine vaccinations, heartworm test, deworming for intestinal parasites, urinalysis, chemistry blood tests, electrolytes, hematology blood tests, and blood pressure check. Wellness exam, routine vaccinations, heartworm test, deworming for intestinal parasites, urinalysis, chemistry blood tests, electrolytes, and hematology blood tests. A serum T4 may be recommended for your dog if it is overweight or gaining weight. Not included in package pricing since this test is only performed if symptoms indicate. Feel free to ask Angie Best, LVT or Dr. Stearman any questions you may have about any of these programs.